In 2011, China’s legislature endorsed a national five-year plan that emphasized, among other things, the need for a boost in innovation and entrepreneurship across the country. That has become a driving force behind the annual MIT-China Innovation and Entrepreneurship Forum (MIT-CHIEF), organized by a number of MIT’s Chinese students. Launched in 2011, the forum aims to foster exchanges between MIT and Chinese tech entrepreneurs — and researchers and students — in hopes of advancing modernization efforts in China to solve energy, environmental, and other issues. This year, hundreds of researchers, entrepreneurs, investors, and students from China and MIT — and across the United States — attended the forum, which included panel discussions and lectures by more than 30 speakers. Panel discussion topics included recent advancements in robotics and artificial intelligence; the future of online education, including massive open online courses; managing and funding startups in China and the United States; opportunities for space technology and health care entrepreneurship; and the importance of U.S. and Chinese startup incubators. “We believe that great ideas can be applied anywhere. Because most of our attendees are Chinese, we hope they can take inspiration from the forum and apply those ideas back to China,” says Yichao Pan, a PhD student in mechanical engineering and co-president of this year’s MIT-CHIEF. “MIT is a great place to start a company, so we want to extend the influence of MIT to other places through the greater Boston area and, through those students in attendance, probably to China,” he says. BelLEDs Technologies team members (left to right) Patrick Lin, Xiaolu Li, and Michael Chen deliver their pitch, complete with a working prototype of their smart LEDs (center, in the suitcase) that illuminated to the sound of music. Keynote speakers included Donald Sadoway, the John F. Elliott Professor of Materials Chemistry; Joe Chen SM ’95, founder and CEO of leading Chinese social network service Renren; Semyon Dukach, the managing director of the Techstars startup accelerator in Boston; Bill Aulet, managing director of the Martin Trust Center for MIT Entrepreneurship; and Peng Yang, co-founder of the One Foundation charity and the Society of Entrepreneurs and Ecology environmental protection organization. Opening remarks were delivered by Alexander “Sandy” Pentland, the Toshiba Professor of Media Arts and Science. Yasheng Huang, associate dean for international programs and action learning at the MIT Sloan School of Management, delivered the closing remarks. This year, more than 200 teams submitted ideas to the forum’s business plan competition, with only six — hailing from MIT and five other universities across the United States — making it to Saturday night’s finale. The six teams each took home a piece of the $20,000 pot, with one $10,000 first-place winner, two $3,000 second-place winners, and three $1,500 third-place winners. Competiting startups, and other entrepreneurs, were also invited to pitch their ideas to Bob Xiaoping Xu, founder of ZhenFund, a Chinese seed-fund firm for early stage startups. Taking home the grand prize was Prometheon Pharma, a team based at the University of Florida. The startup, founded in 2011, has developed biodegradable patches for needleless drug delivery of large-molecule drugs, such as insulin. When applied to skin, a formula on the patch melts into an adhesive gel that also serves as a drug reservoir, so the medication can be steadily delivered through the skin, with results comparable to those from needle injections. Prometheon expects to launch a product in 2018 across Asia, where diabetes is a growing problem. Devon Grimmé, Prometheon’s director of business development, says the prize money will finance an upcoming trip to meet with Chinese pharmaceutical companies. Earning a third-place prize was an MIT team, BelLEDs Technologies, which is developing smart LED lights that can wirelessly connect to the Internet and change colors to match people’s moods and music, with aims of accelerating adoption of energy efficient LED lights worldwide. 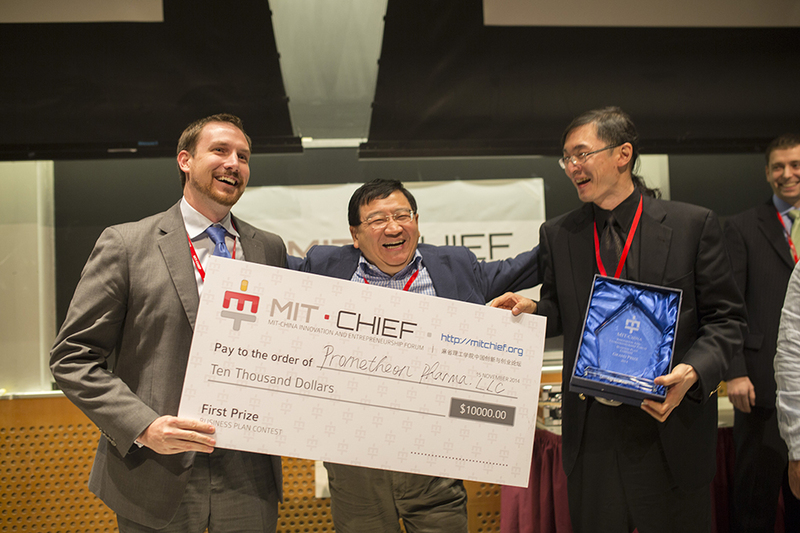 The MIT co-founders are Michael Chen, a PhD student in chemistry; Daniel Taub SM ’09; and Alan Zhou PhD ’94. The two other third-place teams were WeeeApp, an app to make recycling electronics easier, and GreenPoints, which is developing technology to measure energy usage in hotel rooms. The two second-place winners were RapidSOS, which is making a push-button mobile app that connects people instantly with 911, and Sintact Medical Systems, which is developing a polymer film that can be applied to organs to prevent scarring and fusing after surgery. As part of the program, a number of participating teams throughout the five-stage competition — including the finale, various workshops, and demo days — had access to networking and mentorship, as well as a chance to travel to China over each summer to pitch the business to investors and potential partners. This year, 12 startups — 10 from MIT — specializing in clean tech and health care made that China trip, including two winners of other MIT entrepreneurship competitions this year: $100K Entrepreneurship Competition winner Disease Diagnostics Group, which is designing a magnetic-based malaria detector that’s faster and more accurate than traditional tests; and Clean Energy Prize winner Unified Solar, which is making a circuit that augments the output of partially shaded solar cells. Previous business-plan contestants have included Smarking (2013), which was selected for California’s Y-Combinator accelerator this year; Strikingly (2012), which enrolled in the 2012 Y-Combinator; Hermes HQ (2013), which enrolled in Boston’s 2013 Techstars accelerator; and FACES (2014), which is now launching in China. Zhibiao Rao, a PhD student in mechanical engineering, participated in past MIT-CHIEF events, eventually becoming inspired to launch his own startup, Framely. This year, he took his startup through the business plan contest, where he noticed other Chinese students getting in on the action. Forum panels and keynotes focused on the challenges of bringing novel technologies to market and the challenges of launching a companies, from both U.S. and Chinese perspectives. The panel, “Early Stage Investment and Incubator,” moderated by Christina Chase, entrepreneur-in-residence at the Martin Trust Center, for instance, had U.S. and Chinese investors weigh in on how to get financing here and in China. Another panel, “Start-up Development” — moderated by Elaine Chen, a senior lecturer at MIT Sloan — focused on financing, team-building, and customer relations in the startup world. In his keynote, Sadoway addressed the challenges of launching his startup, Ambri, which is developing a liquid-metal battery, based on high-temperature molten metal and salt, that can provide much longer energy storage for the grid. Ambri plans to release its product by late next year. But major hurdles include manufacturing the batteries at scale, the vast complexity of introducing novel technologies to energy, and finding a first client. Chinese investors who attend MIT-CHIEF are encouraged to take heed of such innovations coming out of MIT, Pan says. “That’s another way to bridge the U.S. and China,” he says. This year’s forum was sponsored by 26 initiatives, businesses, and organizations, including ones at MIT, China, and across the greater Boston area. MIT faculty and staff advisors include: Aulet; Huang; Gang Chen, the Carl Richard Soderberg Professor of Power Engineering; Karl Koster, the executive director of Corporate Relations at MIT’s Industrial Liaison Program; Alan White, the senior associate dean and senior lecturer at MIT Sloan; and Victor Zue, the Delta Electronics Professor of Electrical Engineering and Computer Science.